April 16 Wednesday Weather remains same, After staying with Estelle she came nearly down home with me this AM. 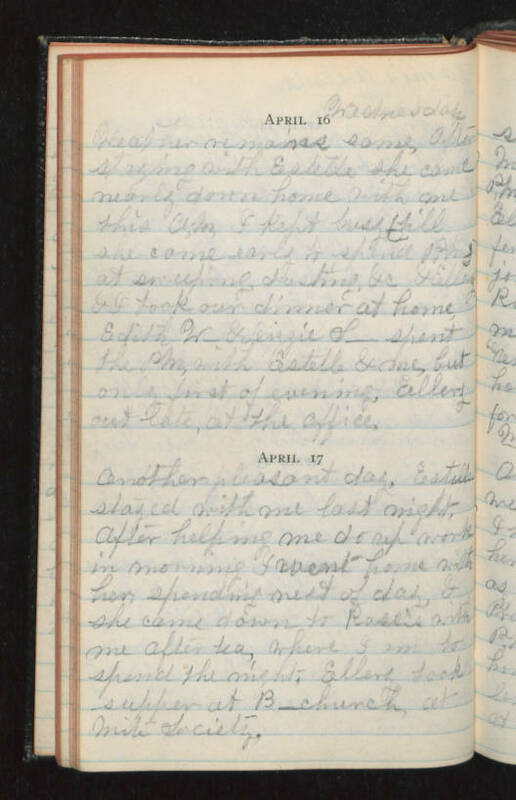 I kept busy (till she came early to spend PM) at sweeping, dusting &c & Ellery and I took our dinner at home, Edith W_ & Lizzie S_ spent the PM, with Estelle & me, but only first of evening, Ellery out late, at the office. April 17 Another pleasant day. Estelle stayed with me last night. After helping me do up work in morning, I went home with her, spending rest of day, & she came down to Rose's with me after tea, where I am to spend the night. Ellery took supper at B_ church at Nite Society.